When news of Resident Evil: Operation Raccoon City trickled out, gamers were justifiably excited. After all, who wouldn't want to play a four player, class-based co-op shooter set in the much-beloved Resident Evil universe? The potential for something special was present from the start, and many figured it would be akin to Left 4 Dead for the BioHazard set. Sadly, this isn’t the case. Not only is Raccoon City not in the same league as Left 4 Dead, it’s not even a decent Resident Evil game. Both the single- and multiplayer elements of Resident Evil: Operation Raccoon City takes place in (you guessed it) Raccoon City, the burg in which the series' famed virus was first unleashed on the world all those years ago. Mirroring many of the events in Resident Evil 2, the campaign follows the exploits of the nefarious Umbrella Corporation's special ops team, sent in to clean up the mess created by the company's scientists by whatever means necessary (hint: it involves lots of guns). 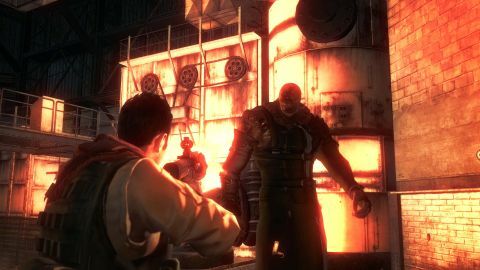 While the game includes plenty of knowing nods to Resident Evil fans and a number of cameos by some familiar faces, the narrative ultimately falls flat due to some confusing "twists" and one of the most absurdly unexplained endings in recent memory. If you don't end up asking yourself what just happened at the end of the campaign's seventh and final mission, it might be because you're too busy asking why it happened at all. Raccoon City’s narrative misses the mark on a number of levels, not the least of which is the fact that it never gives the player any reason to become even remotely invested emotionally. Your character and your squad are downright unlikeable, especially when trying to kill the heroes that we all know and love. It’s odd that the developers didn’t include an alternate campaign in which players could control the survivors, as a four-player co-op “remake” of Resident Evil 2 would have been a lot more enjoyable than the game’s core campaign. Rather than put the player in the boots of a single character throughout the story, the developers decided to embrace the co-op aspect right off the bat, encouraging experimentation by allowing players to switch between character classes before each mission. Most of the classes you've come to expect in a modern-day shooter are represented here, including Assault, Medic, and Recon, each with his or her own uniques skills and weapons. Some of these (like improved body armor and faster reload speed) are passive, while abilities like flaming bullets and temporarily unlimited ammo can be activated after a particular amount of time passes. It’s a solid enough system, keeping the action as interesting as you’d like, though we found ourselves focusing mainly on upgrading our Assault and Medic classes out of personal preference. However, Raccoon City’s hop-in/hop-out cooperative play penalizes those players that don’t create a well-rounded group of soldiers, as it’s not uncommon to jump into a game only to find that the class you spent all that time maxing out has already been taken by another player. Yes, your team is limited to one of each character class, so all the XP you spent creating a powerful Assault character means nothing if another player picked that class first.The game was presumably designed this way to encourage players not to rely on a single class, but it ultimately feels like a penalty. Description Play as Umbrella operatives in this bleak and violent return to Raccoon City with squad-based gameplay and... Leon and Claire as targets?